Hwy 371 project study location map between Pine River and Nisswa in Crow Wing and Cass counties. A project study to expand Highway 371 to four lanes and improve access along the corridor, including the Paul Bunyan Trail, in the communities of Nisswa, Pequot Lakes, Jenkins and Pine River. The two lane Highway 371 segment between Jenkins and Pine River in Cass County remains unscheduled and in 'Project Study' status until funding becomes available. 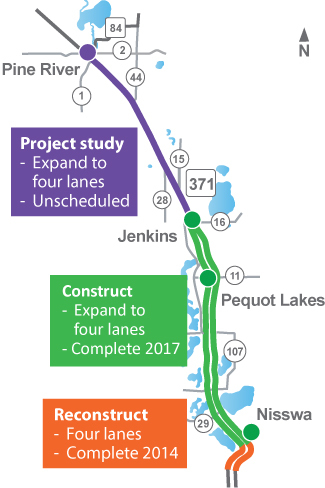 The $50 million design-build, Highway 371 four lane expansion between Crow Wing CR 18 in Nisswa and CR 16 in Jenkins opened to traffic on Oct. 6, 2017. The project included a new realignment in Pequot Lakes with two reduced conflict intersections and a Crow Wing CR 11 interchange for easy, safer downtown access. Landscape along new four lane 2018-2019.